Mokoduo Erasmus Davidson (MED) Attorneys are compassionate but uncompromising. We have proudly built our practice on the belief that we can make a genuine difference in the lives of those who need our help. 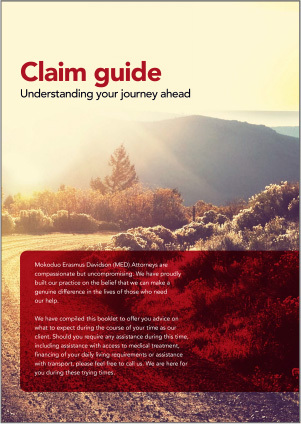 We have compiled a booklet to offer you advice on what to expect during the course of your time as our client. Should you require any assistance during this time, including assistance with access to medical treatment, financing of your daily living requirements or assistance with transport, please feel free to contact us. Depending on the nature of your claim, a monetary value is placed on the gap between your predicted life path before the incident, and your actual life path since the incident. The amount of care and support needed is a factor in determining how much compensation is awarded.